Emerging trends such as social networking, Web 2.0, shifts to mobile and wireless networking, virtualization and cloud computing are all helping to create complex security landscapes that are difficult to manage. It is becoming increasingly difficult to keep network equipment updated with the necessary software patches that will help prevent network breaches, data theft, malware and denial of service attacks. 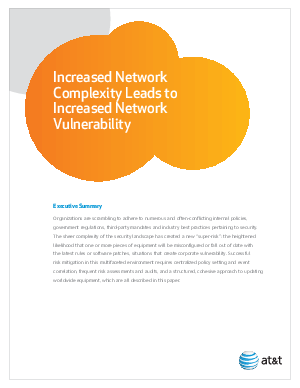 This paper discusses how to help reduce risk and successfully manage your security infrastructure through conducting vulnerability assessments, using discovery tools, adopting centralized policy setting and event correlation, and taking a cohesive approach to updating network equipment.